Next Article Did Rhu artist paint portrait? 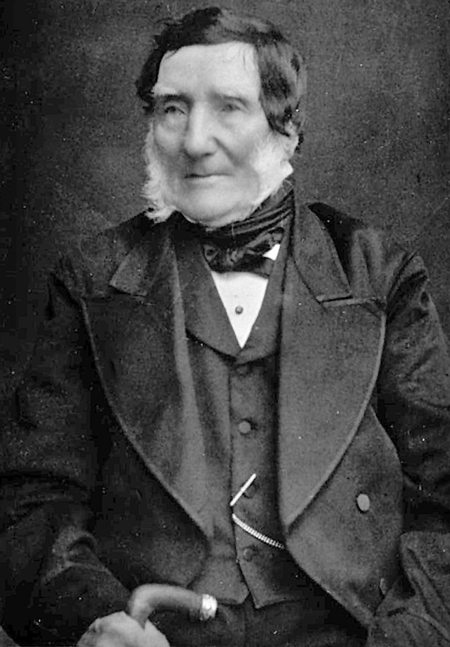 Much of the content is derived from the fascinating reminiscences of the author’s uncle, Gabriel MacLeod, who came to Helensburgh as a child around the time it gained burgh status in 1802. This is what the book, published by the burgh firm of Macneur & Bryden, had to say: “The town managed for a few years to support a theatre. “During its brief existence, the surrounding gentry gave it substantial support. “About 1809, the Magistrates and Council of the town began to hold their courts in the theatre, which they ultimately acquired through purchase, and they continued to do so until the erection of the present handsome and commodious Town’s House. “The old theatre, if not a thing of beauty, was at all events a very useful building, for besides holding the municipal dignitaries while they sat in solemn conclave, it held the Public Subscription Library, got up by £4 shares owned by parties connected with the town. 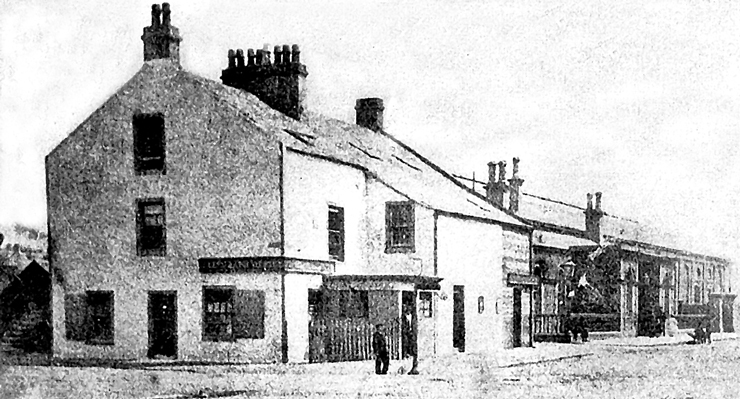 It is difficult to imagine Helensburgh possessing its own theatre prior to the 1802 formation of the burgh, especially in view of the fact that it was of ambitious dimensions, this being at a time when most of the existing buildings were low and humble structures, so it seems reasonable to suppose it was constructed after that formative date. Another helpful source of information is the book, “The Story of Helensburgh”, circa 1894, also published by Macneur & Bryden. Although anonymous, it is widely understood to be the work of George MacLachlan, who was the Town Clerk from 1847 until 1906. He has gone down in history as the longest-serving town clerk in Scotland, albeit assisted by his son from 1902. As such, his knowledge of Helensburgh and its history must have been considerable. This is what he had to say about the theatre: “It was a square building, utterly destitute of ornament, and possessed accommodation for from 250 to 300 of an audience. “How the funds were originally raised, or where the patrons of the drama came from, it is difficult to imagine. “One fact however was patent — there was the theatre, or Helensburgh Play House, and it had its patrons, actors and public for some years. “However, about the date of the first Reform Act, it ceased to be occupied as a temple of the drama. Fashion had changed, or funds had run out, and it passed into the hands of the Corporation. “A division wall was run up, cutting off the stage from the auditorium. The pit and boxes were converted into Council Chambers and Court House, while the ground floor of the former stage was transformed into a Police Office, with prison cells adjacent. “The building was for many years the only one for concerts, lectures and entertainments, which enlivened the winter evenings. “It was also occupied on Sundays. In the early history of the Established Church, and other congregations, it offered them temporary accommodation. “There was no proper pulpit, but the preacher occupied a side box, and the precentor sat opposite, and the congregation ranged in a semi-circle, having the preacher at one end, and the precentor at the other. “It was no unusual thing that the captives of the police on Saturday nights remained imprisoned in the cells throughout Sunday, generally awakening from their drunken slumbers to a sense of extreme discomfort and misery. “The worshippers frequently listened to the mournful sighing of the prisoners, doomed to darkness and not infrequently to more clamant appeals. Here was no thespian performance, but a genuine cry straight from the heart. In his account, MacLachlan refers to usage as a theatre ceasing about the time of the first Reform Act. This is presumably a reference by him to the epochal Act of 1832. Certainly, in Wade’s 1822 publication “Watering Places of Scotland”, it states that amenities in Helensburgh include a theatre and post office, but there is no mention of the theatre in Fowler’s Directory edition of 1834. It is known that the theatre building also housed a grocery for some time. Yet another use was the holding of a school from time to time. Fowler’s Directory of 1834 confirms that this was the case. A later school that was conducted within the premises was the so-called Helensburgh Ragged, or Industrial School. Part of a national network, the Ragged School is referred to by George MacLachlan: “The educational needs of the community were fairly provided for, but there was a lower strata of the population not reached who were too poor and too indifferent to pay the usual fees. “They were a source of anxious concern for some years. The plan was to form a school, not a charity one, but where the fees were reduced to such a small sum as could cause no difficulty to the parent. This took place in 1851, but a couple of years later the school transferred to custom-built premises at Grant Street. It is clear that the Old Theatre building played an indispensable part in the life and times of Helensburgh over a considerable period of time. 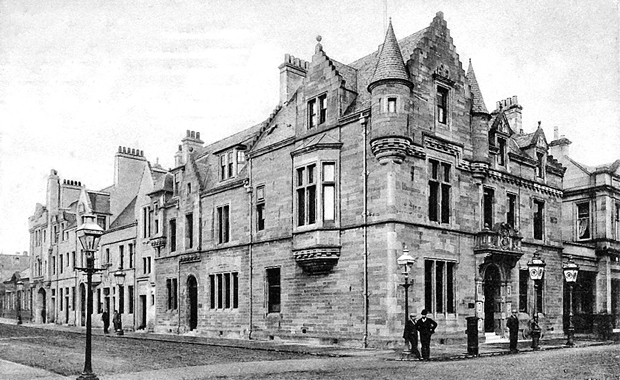 It was demolished in 1878, and the site was built on later that year to accommodate the handsome new Municipal Buildings (left) designed by architect John Honeyman in Scots Baronial style. In 1906, a tasteful and sympathetic extension by Alexander Nisbet Paterson brought the building further up Sinclair Street. The world has moved on, and it is quite a few years since the premises were last used for their intended function. However in 2016, after a period of some uncertainty, plans were announced by the Glasgow-based Peckham’s chain to convert the premises for use as a deli and restaurant on the ground floor, along with function suites, and on the upper floors the creation of six flats. They hope it will open for business in the spring of 2018. Whatever the future holds, it seems unlikely that the structure will ever serve such a range of uses as its predecessor. The story of the Old Theatre building is far from complete. It would be fascinating if more information were to come to light, especially in relation to its function as a theatre.